I have a brilliant idea to cut back on crime in this country! My idea is to impose a punishment on every convicted criminal that would be so horrible and wretched that it would probably stop crime altogether. We should sentence every convicted criminal to wallpaper stripping! For every day of the length of their sentence they would have to go to all the outdated homes across the country and spend the entire day stripping off all the old and ugly wallpaper. Those convicted of the more serious crimes would have to take all the wallpaper that was put up without sizing the walls first and the walls with multiple layers of wallpaper!! I think this would stop crime dead in its tracks!!! 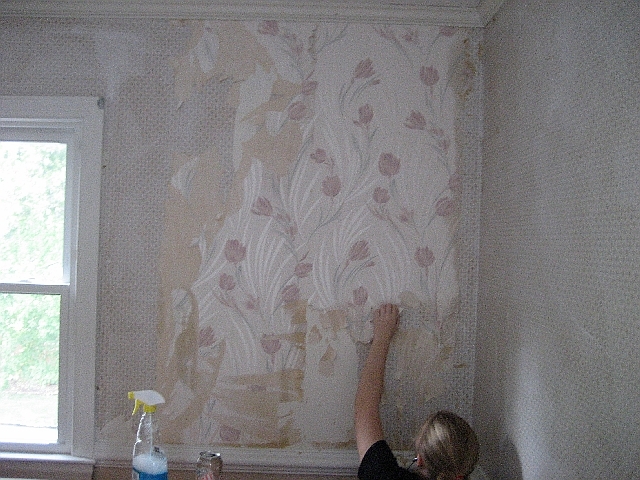 That’s how I spent my last weekend, stripping ugly, outdated wallpaper. Ugh! Thank goodness that was the last of it. My home is now wallpaper free. Yeah! Here is the offending wallpaper. 1980’s mauve tulips in a textured paper with shiny highlights! And of course there is another layer beneath it! 1970’s country! See what my daughter has in her hand, that is my secret wallpaper stripping weapon. Windex!! Yes in deed, the best wallpaper stripper ever! Now, I tell you, is robbing a bank really worth the hell that would follow if you had to do this everyday for 10 years! NOT! Ahem…Well; at least no one can say you didn’t give the wallpaper time to make a comeback. HAHA! I bet it’ll look FAB when you’re done with the makeover. Which reminds me, I’m supposed to be redoing my bedroom, too! I’m sure your hard work will pay off–I love the chair rail and the windows. I hope you post the new room. That is too funny! You’re right, though, stripping wallpaper is the worst! I enjoy your blog! I saw a woman on HGTV take it off in HUGE layers. First she takes down the top layer, then scores the 2nd (the glue) then sprays it with laundry detergent and water mixed. The glue then came off in large sheets. And OMG!! The kids are getting huge!!!! Is she a teen now? It’s been so long since I’ve seen either of them. I’d love to see pics. i hate stripping wall paper. HA HA HA!!! Yes, I believe that would definitely deter crime. I don’t think there is an “easy” solution for removing wallpaper. Its all hard work. When we were sentenced to our time, we used vinegar and hot water, but recently I heard that fabric softener(downy) in hot water works well, too. Haven’t tried the windex trick, but I have a feeling I haven’t seen the last of wallpaper stripping. Ugh, don’t remind me how awful that job is! 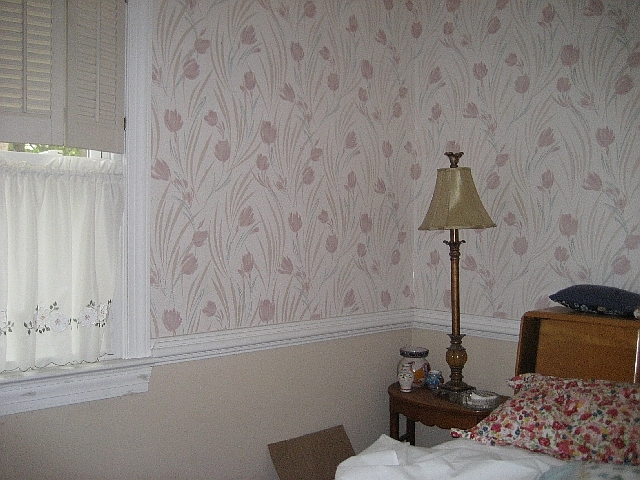 We had once moved into the in-laws house & I had to get rid of the 70s wallpaper in every room! Here is what surprises were awaiting…in the bathroom mil wallpapered over the huge hole left by a previous medicine cabinet (the current mirror was covering it so why bother patching the hole!? )…that had to be fixed of course. The the kitchen had incredibly tough wallpaper & wasn’t coming off or if it was it was taking parts of the wall, too – we had to rent a big professional steamer…what a mess. I was glad there was no wallpaper to remove in our current house (although the kitchen has it & I am toying with the idea of removing it or replacing it). I have been there, and I agree it is one of the most awful jobs! I’m sure it will be well worth it when you are all done 🙂 Can’t wait to see how it turns out. Your hilarious!! I agree with peeling off wallpaper would make any criminal turn his back on crime and would walk the straight and narrow. I hate hate peeling wallpaper! But, one time I got lucky. I tried to pull down my kitchen wallpaper and it was the first time I ever tried to pull off the wallpaper, everyone I knew told me it was going to take forever but I did the whole kitchen in less than an hour and all I can think is whoever put it up didn’t know what they was doing but it wasn’t loose but once I started pulling and I used no spray or chemicals or even a putty knife all I used was my hands and the strips came off in whole strips about 8 feet in length. Since then I have realized it’s not as easy as I thought. Ughhhhhhh…..
You must have been MIGHTY bad to be sentenced to that wallpaper! On the other hand, the divine vintage buttons in your banner have made me salivate! It’s one of my biggest passions — you should see all the buttons I’ve collected over the years! At least it’s one of the least expensive things to buy on eBay… otherwise, I’d be on the streets (but no button-less)! By the way, sorry the thought of my starched cotton underpinnings wore you out so much! It’s the only way for me to get my petticoats stiff enough to be an adequate subsitute for the offensive *hoops* of the day… mere spray starch just isn’t enough! If things go well, I’ll have my camp-mates take a photo of me. Maybe Paris Hilton and Nicole Richey should be at your house stripping paper instead of serving there 8 hours in jail. LOL!!! Wallpaper stripping, yuck! 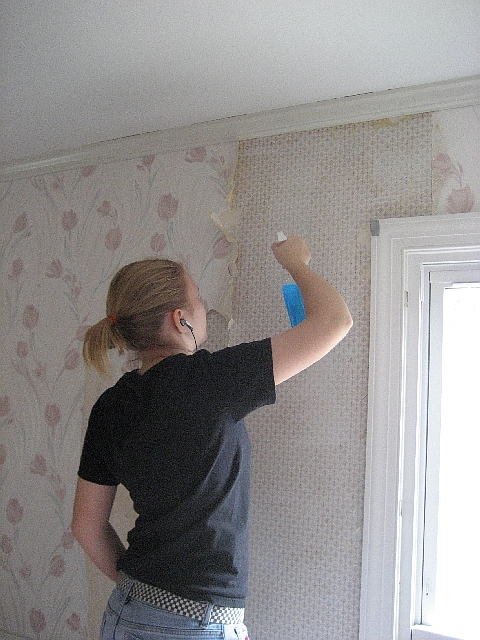 I remember one time in an old 100 year old victorian home, stripping wallpaper. We started in a corner and peeled off a small piece, under was another layer, then another, then another! ELEVEN (yes 11) layers later, the horse hair plaster started coming off the lathe when you pulled the last layer. We ended up using joint compound and stuccoed the walls. That’s hysterical! And probably the best deterent there is as anyone who has stripped wallpaper can attest to!! !